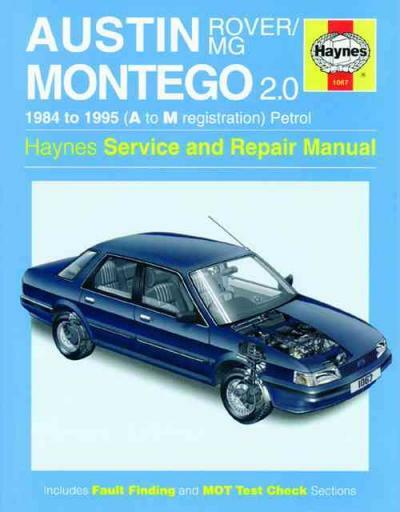 Austin/MG/Rover Montego 2.0 Petrol 1984 - 1995 manual covers: Saloon and Estate, including Turbo, Vanden Plas Including Special/Limited Editions 1984 - 1995, A to M2.0 litre (1994cc) For coverage of 1.3 litre 1.6 litre petrol models, see Manual HA1066. For coverage of Diesel engine, see Manual HA1857.Inside this manual you will find: Routine Maintenance, tune-up procedures, engine repair, cooling and heating, air-conditioning, fuel and exhaust, emissions control, ignition, brakes, suspension and steering, electrical systems and wiring diagrams.Haynes repair manuals can save you money on maintenance and repair bills. Step-by-step procedures and illustrations guide you through every job, from basic maintenance and troubleshooting, to complete teardown rebuild.